Our Project Management/MRPII system monitors the production sequence and scheduled completion of each stage of tool building, insuring on-time delivery and on budget cost. 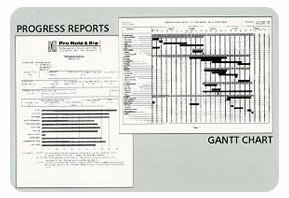 All jobs are reviewed weekly and are kept on schedule using Gantt charts and Project Control reports. Customers receive weekly Progress Reports, keeping them abreast of the status of each job at every phase of production.